Peruvian fried trout trucha frita literally means “fried trout”. It is not a culinary masterpiece, but is honest local food from the Andes, where seafood is absence. Despite there being a wealth of sea food in Peru, this does not make its way to the Andean highlands, where the only source of fish is fresh water and the most widely available is trout. 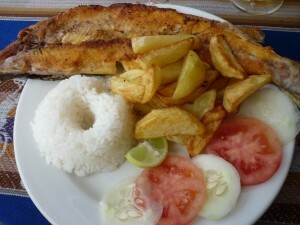 Unsurprisingly rice and fries or chips feature in the dish, as with most dishes in Peru. A slice of fresh lemon is also a winning touch. What makes Peruvian fried trout is its simplicity and the freshness that a “just caught fish” provides. It is also the combination The key to this dish is to buy very fresh fish. Its simplicity is its beauty, but can take away as much as it gives if you use frozen or old fish. This is what local dishes in Peru are based on. Simplicity and great ingredients. Turn the fish on to its back and using a sharp knife cut along one side of the spine, cutting the head and tail as evenly in half as possible. Peel the potatoes, cut them in half and then into segments. Bring a saucepan of water to the boil and cook the potatoes on a high heat for 6 minutes. Preheat the oven to 180C. Remove the potatoes from the water and toss in 3 tbsp oil, salt and pepper. Lightly oil a flat baking tray and cook potatoes for 20 minutes. 15 minutes before the chips have finished cooking bring the potato water back to the boil, add the rice and reduce to a simmer. Slice a tomato into 6 and cut off 6 slices of cucumber as a garnish. Cut a wedge of lime for each plate. Add a little oil with the butter to a frying pan, then the fish and place over a medium flame. Sieve the flour evenly over the cooking fish and after 4 minutes transfer to the grill on a medium heat for 3 minutes. Add a sprinkle of salt. As this last step happens drain the rice well and push into a cup. Turn this onto the plate with the garnish. Add the chips and the fish to serve. Have you tried Peruvian fried trout? Have another dish from the local area that you would like to share? We’d love to hear from you. Please comment below!